Google for years has offered tools to help small merchants increase their online visibility, but only if those retailers had digital records of what was on their shelves. Like many small businesses, Talbots lacked digital records of what was in stock and never got around to building one for its mammoth inventory of 65,000 products, which include everything from Lionel Trains collectibles and the latest must-have Legos. Then last year the store purchased three devices from Pointy, a Dublin startup that helps independent merchants increase their visibility online and lure consumers who otherwise would shop at Amazon.com Inc. and EBay Inc. or mega-retailers like Walmart Inc. that have entire teams dedicated to being visible online. The US$500 device plugs into a cash register and, using each item’s bar code as employees ring up sales, creates a digital inventory that is posted online and visible in Google searches along with the retailer's location. While Pointy’s hardware has been around for four years, it just got more appealing thanks to a new partnership with Google that lets merchants buy “local inventory ads” that appear in the search results of nearby shoppers. Think of it as a Google Maps for local products. Talbots, which has been in business for more than 60 years, saw immediate results. Potential shoppers called to confirm the items they wanted were in stock. Talbots knew these were new customers since many asked for directions, and the store surmised that at least some of these newbies were tipped off by the advertising generated by the Google-Pointy partnership. Sales are up by double digits this year, which Talbots attributed to this added online visibility as well as the closure of nearby Toys “R” Us locations. 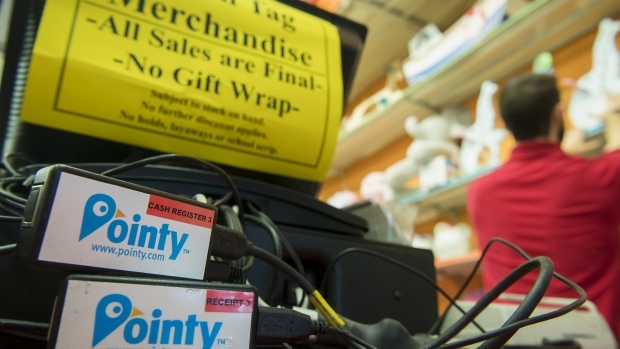 Pointy already has devices in 10,000 U.S. retail locations and sees plenty of room to grow. Ninety percent of the US$5.4 trillion in U.S. retail spending this year will happen in stores, according to EMarketer Inc. Those in-store transactions are increasingly influenced by online experiences, which include researching products and searching for where they are available. Many shoppers prefer to buy an item in a store after inspecting it and speaking with an expert than buying it online and waiting for delivery, says Mark Cummins, who co-founded Pointy. Cummins started Pointy in 2014 after selling his previous startup Plink to Google in 2010. Plink let users search the web using images rather than keywords. Cummins got the idea for Pointy following a party where he and friends enjoyed craft beer purchased from a nearby market. He wanted to buy the beer but couldn’t remember the name of the store, which got him thinking you can search online for products around the world but you can’t always find out what’s on the shelf at the shop around the corner. The low-cost devices aimed at small businesses follow the path of Square Inc., which started a decade ago by selling cheap smartphone plug-ins that let dog walkers and pedicabs accept credit cards. Square processed US$65 billion in payments last year and offers additional financial services, highlighting how simple solutions for small businesses can add up to big business. Pointy is already diversifying its revenue. In addition to selling the device, it helps local businesses like Talbots buy Google search advertising and gets a commission on those sales. Talbots Toys has been spending about US$300 a month on Google advertising, which it is increasing over the holiday season when toy shopping spikes. Digital advertising sales will total US$111 billion this year, up 25.7 per cent from a year ago, with Google leading the market, according to EMarketer. Pointy could help Google increase that market even further if it encourages more small retailers to buy search ads.